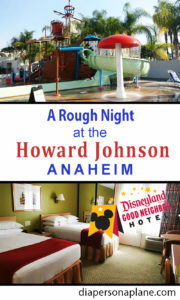 The Howard Johnson Anaheim Hotel and Water Playground opened 10 years after Disneyland debuted to the public and was the first good neighbor hotel located in proximity to the park. It’s a five-time winner of TripAdvisor’s Top 25 Hotels for Families in the United States, and claims to be the #9 family hotel in the entire country. A bewildering fact to us since the rooms look and smell like they haven’t changed since 1965. They call it retro family fun, but the laminate facing furniture, outdoor flush handle toilets, and bile colored paint on the walls combined with the musty smell from grandma’s house seems like a rip off to us at $189 a night. The most prominent feature of this hotel is the aforementioned water park on the hotel grounds, Castaway Cove. We’ve been wanting to stay at this hotel since I started working for the airlines and we were frequenting Disneyland on a semi monthly basis. 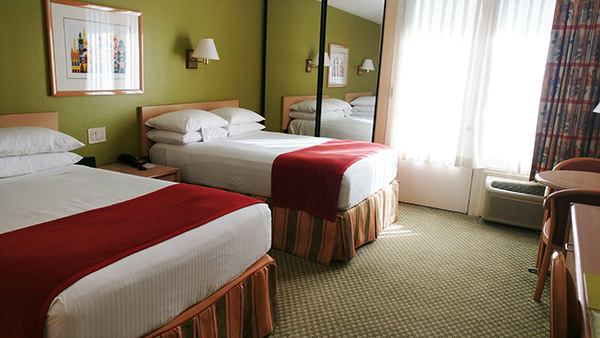 We’ve heard people rave about this hotel, both personally and online, and have always wanted to stay here. We’d been waiting for availability with an interline travel discount and finally found an opportunity this weekend. 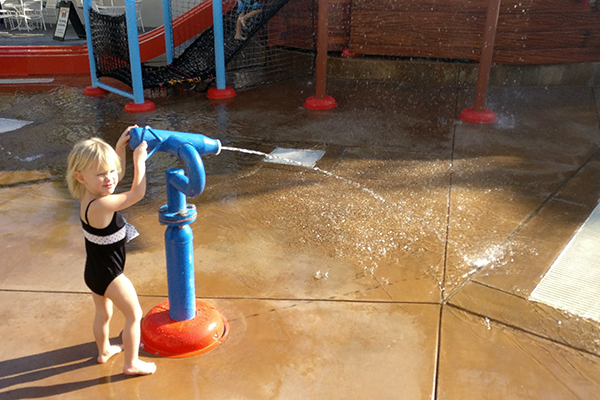 The water park is a glorified splash pad. Our little munchkin was bored after 20 minutes, and preferred the deep water pool across the property over the slow, slow, slow crawling slide that the children had to push themselves down in the freezing water temperatures. 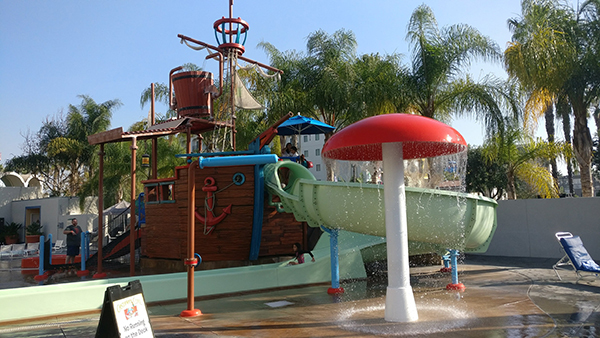 Two infant slides, one slow baby slide, and a pirate ship to walk between the two, plus a mushroom water fountain, a 1 foot deep wading pool, a couple water shooters and a hot tub make up this “water park”. The best perk about this hotel is that there is no parking charge. 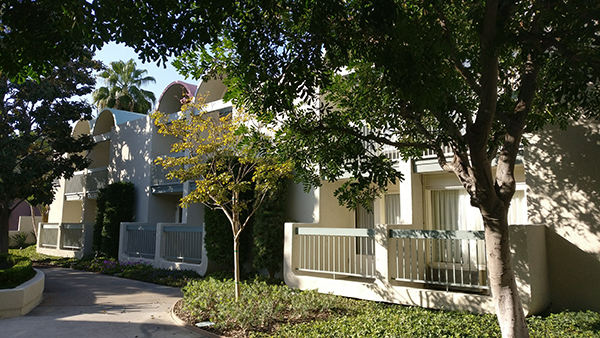 A rarity when Disney or California is involved, but we could stay down the street in the Hyatt with a bunk bed, sofa sleeper, king bed, huge bathroom, free breakfast, clean and smell free also with a swimming pool and hot tub for nearly $75 less even after paying for parking. The room we are squashed into has two double beds, and a giant awkward dresser that lines the entire span of the wall on the opposite side of the room. The ceiling inside the room is domed, with windows on the east and west domes covered in bright outdoor fluorescent lights. The closet is covered in mirrors that then reflect the east window and recast the light from it throughout the room. If you are looking for the midnight sun in California, this is the place to stay. Profit seems to trump all else at this hotel. Having remodeled several homes, we are familiar with the products they’ve used for minimal refurbishments. The cheapest of cheap tubs that literally depress when standing in the shower. Laminate facing furniture with pieces that can simply be striped off and replaced when destroyed and carpet for baseboards. But, I’m not even complaining about that. With the thousands of families that get suckered into staying here, it’s likely a smart move. I’m not even complaining about the retro architecture; that’s pretty cool. No, I’m complaining about the accompanying price tag for the pathetic amenities. ► For Kids: With the high competition of hotels surrounding Disneyland, there is virtually no reason to stay here unless you love the nostalgia of coming to the first Disneyland era hotel, that hasn’t changed much since it was built. A few dollars more and you can stay on property at Paradise Pier with a free character breakfast, or at the previously mentioned Hyatt. 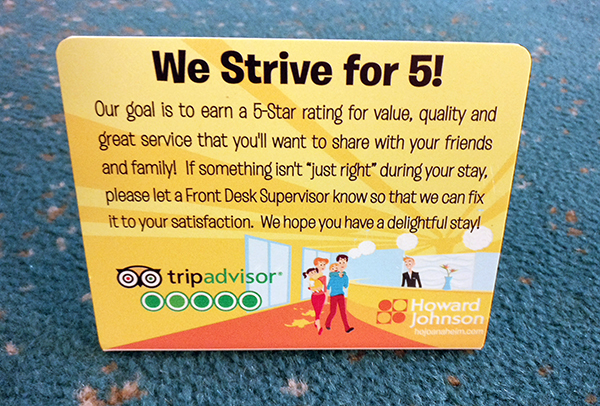 The hotel is plastered with signs that read: “We Strive for 5”. If you’ve got a good thing going, why beg for good reviews? I can physically see three of these appeals as I sit here typing this. I kind of think if you could fix the smell, you would have already. …or are you really just hoping for a 3 or 4? 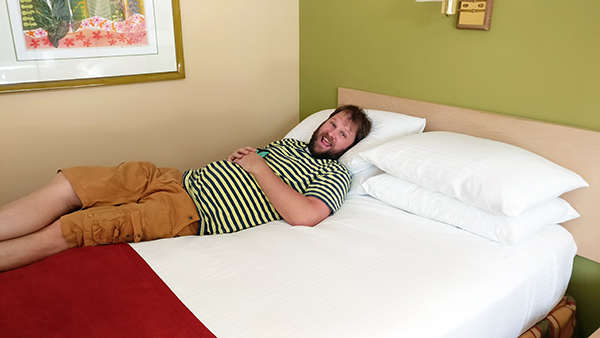 ► Nap-Time Version: The Howard Johnson Anaheim Hotel and Water Playground was one of the first Disneyland hotels to open in Anaheim, and is best left in the past. 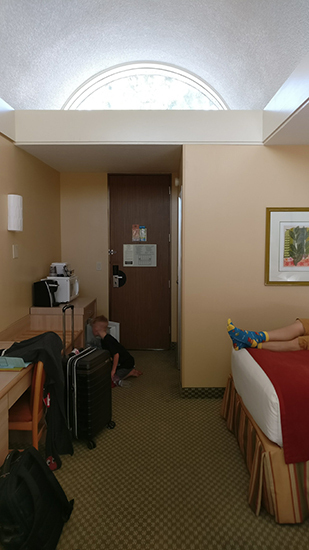 This Howard Johnson Anaheim Hotel also offers different room arrangements including a room with a bunk bed, which may have changed our review slightly. 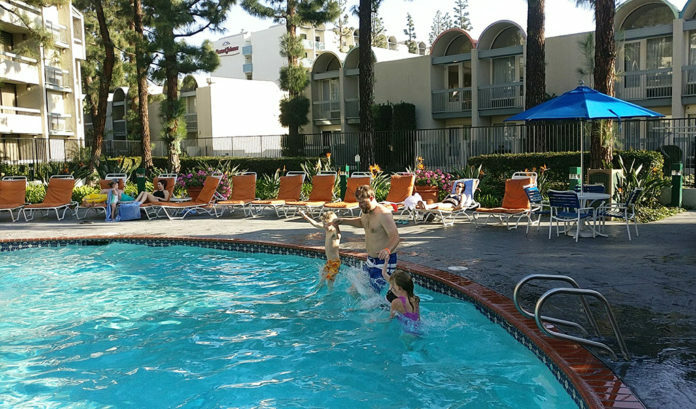 Have you stayed at the Howard Johnson Anaheim Hotel and Water Playground? What did you think? Check out our rankings of all 6 Disney Parks Across the Globe and see where your favorite park lands on the list.